The behavior of copying existing code to reuse or modify its functionality is very common in the software development. However, when developers clone the existing code, they also clone any vulnerabilities in it. Thus, it seriously affects the security of the system. In this paper, we propose a novel semantics-based approach called SCVD for cloned vulnerable code detection. We use the full path traversal algorithm to transform the Program Dependency Graph (PDG) into a tree structure while preserving all the semantic information carried by the PDG and apply the tree to the cloned vulnerable code detection. We use the identifier name mapping technique to eliminate the impact of identifier name modification. 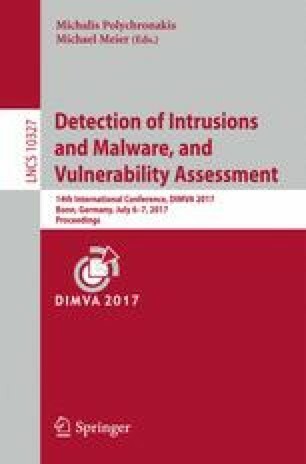 Our key insights are converting the complex graph similarity problem into a simpler tree similarity problem and using the identifier name mapping technique to improve the effectiveness of semantics-based cloned vulnerable code detection. We have developed a practical tool based on our approach and performed a large number of experiments to evaluate the performance from three aspects, including the false positive rate, false negative rate, and time cost. The experiment results show that our approach has a significant improvement on the vulnerability detection effectiveness compared with the existing approaches and has lower time cost than subgraph isomorphism approaches. This paper is supported by the National Science Foundation of China under grant No. 61672249, the National Basic Research Program of China (973 Program) under grant No. 2014CB340600, the National Key Research & Development (R&D) Plan of China under grant No. 2016YFB0200300, and the Natural Science Foundation of Hebei Province under grant No. F2015201089.